The world turned black as the sun slipped away, nothing but glassy water and shadows in the distance. I floated in the middle of the river, staring at stars and thinking about why Lock 23 was never built. The official story is that after planning it, the Army Corps of Engineers decided Lock 24 could hold enough water to make 23 unnecessary. They scrapped it, but left the numbers the same to avoid confusion. Perhaps that is all true, but on Halloween, when night turns islands into shadows, it’s hard not to wonder if 23 was unlucky, if there were problems with the construction, if someone wanted to hide something under higher water. I glided over the black river, waiting for the moon to rise, and looking for ghost ships and poltergeist, but I only saw shooting stars. Then I got close to Lock 24. The spotlight of a tug flashed in the distance and I knew I couldn’t lock down for at least an hour. I looked at my maps for a way around, but found nothing hopeful. I’d have to wait or find a campsite somewhere. 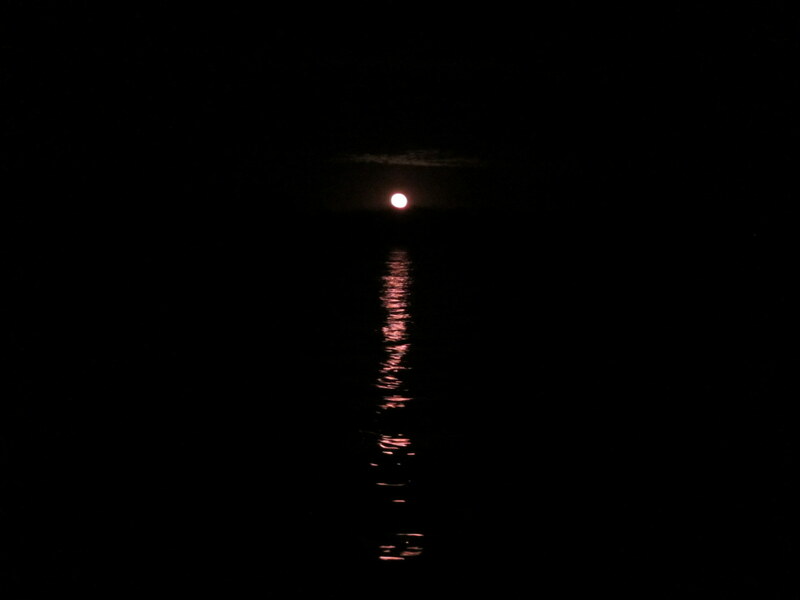 Just then, the moon came over the horizon, glowing orange and big. It lit up the world in a pale, silver light and a crescent of sand rose out of the darkness beside me. I stared at, not believing it existed. Dams drown all the sandbars this close to a lock, but there it was, an island of sand glowing in the moonlight. “Perhaps the water is just that low,” I thought. I hopped out of the boat and dragged it ashore, excited to find a perfect campsite right where I needed one, right where it was so unexpected. After setting up camp, I cooked dinner and ate while watching the moon rise higher and higher into the sky. “What strange luck,” I thought. Then I stopped and remembered the tug’s spotlight. “It should have been here by now,” I said. I looked out and saw nothing but darkness. I listened but heard only cars on a distant highway. My mind began to spin. Had I imagined it? Was it real? What ever happened to Lock 23? What was someone trying to hide under the high water of a lock? What was a sandbar doing this close to Lock 24? Why did it appear right when I needed to stop? I stood up, grabbed my headlamp and took a few steps toward the center of the island. The air felt suddenly cool, the night darker. I pressed a button and the headlamp blazed to life in my hand. I stared at the cone of bright light splashing out across the sand. Just sand. Lots of sand. “So much for Halloween,” I thought, settling back to mac and cheese. The tug pulled by an hour later. The sandbar’s probably just recent dredgings to keep the channel open. And who knows about Lock 23, maybe it was just unnecessary. Posted in Angle to Key WestTagged AKW November, Angle to Key West, ghosts, halloween, locks, mississippi river, sandbarBookmark the permalink. The mind is truly wondrous!